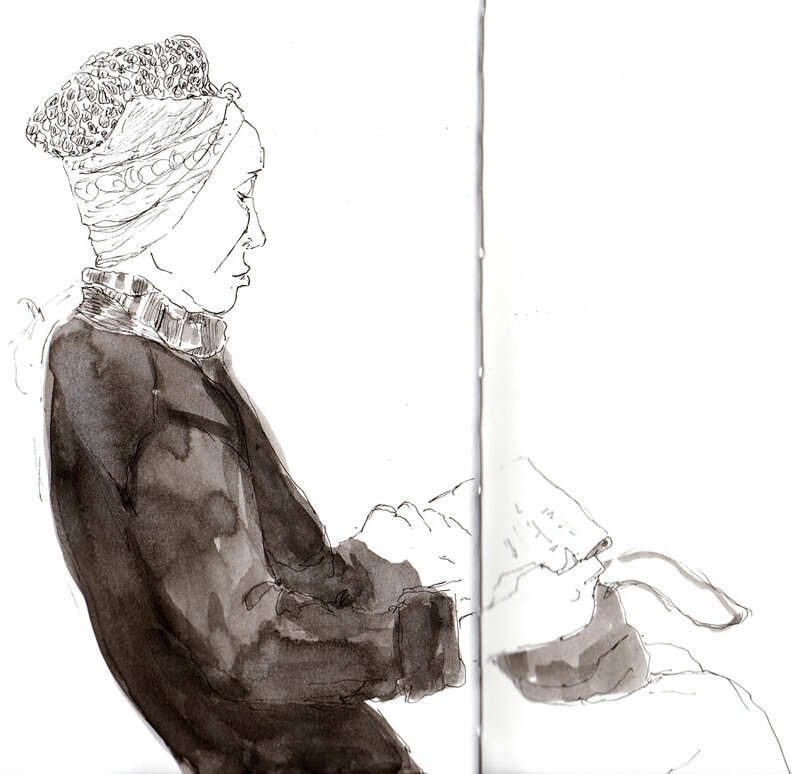 When I saw this woman reading on BART I had to draw her. She seemed to express the essence of dignity to me. She was carefully dressed and groomed, all in white, grey and black, with her hair covered in a white crocheted net and that wrapped with a perfectly ironed bandana, tied in a tiny bow in front. This was my first drawing in my new Fabriano Venezia sketchbook that Roz had tested and praised and that I bought in a couple of sizes from Wet Paint. This is in the 9×6″ size. I left the first page blank to serve as a title page/table of contents later and did this drawing on the next page. 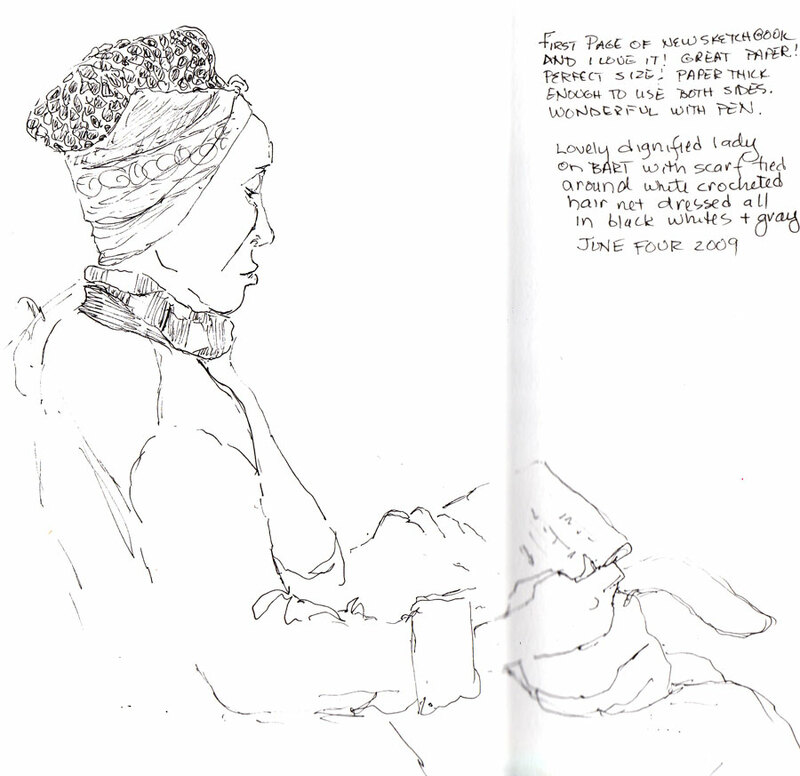 I was totally in love with the sketchbook, writing a little rave review on the page of this first sketch about how wonderfully smooth and thick the paper was, and how nicely it worked with the Micron Pigma .01. I was a little concerned about how much larger and heavier to carry around it is than the Moleskine watercolor notebooks I’ve been using, but thought it would be worth it. BUT when I tried to scan my drawing and the book didn’t quite fit on the scanner, cropping off part of the image, and the middle seam caused half the image to blur and have a dark shadow, no matter what I tried. Then tonight I tried adding a watered down ink wash to her jacket, which had been black. The paper acted very strangely, not at all like I’d expected. I knew it wasn’t watercolor paper, and thus wasn’t sized, but now I’m now worried how these books will react with watercolor. I guess I’ll find out soon. Here’s the same image with the ink wash that went all splotchy. She was so carefully groomed, with everything perfectly ironed and smooth and now she looks much less dignified with her splotchy jacket. I don’t think the ink wash added anything positive to the drawing, do you? And I don’t think adding more ink to try to make it smoother or darker would be a good thing either. Actually I like the ink wash. I think in a kind of abstract way the composition with that large dark area makes a more interesting composition. I like the ink wash, too, Jana, and while the image is not as pristine, her dignity shines through. I agree, the ink wash does add, and sets off her face better. I like the splotchiness. Thanks for the review of the Venezia, I’ve been wanting to try one, maybe not so much now. Keep us posted on the sketchbooks, okay? I love the splotchy. It adds contrast to the drawing and the tidiness of the character you describe. The artist in you has to show up somewhere. Title the splotches creativity! I like it too. It looks rather like an India ink drawing with water added. I like them both! You did a great job of capturing her ‘dignity’ too. I know what you mean about the scanner-making things blurry. I use the Strathmore wire bound sketchbooks, they take the paint well, they buckle somewhat and then after they dry they calm down HA! I’m sure you’ll figure out something and keep us ‘posted’. I like the original drawing because it emphasizes her femininity–the outlined breast–and it keeps interest around the more detailed face. She seems a mixture of the African, the feminine, and–since she is absorbed by reading–the thoughtful. It makes you wonder what she is reading. So, your new book is a little, at the moment, disappointing to you. Clearly, we all think you’ve made a good sketch. Jana…It’s such a lovely drawing! What a shame that the paper reacted like that. I agree with you–that the jacket did not really need to be colored in, or at least not fully…perhaps just a few swipes to indicate. I also agree with you, that many older women have a distinct “presence”, even elegance, to themselves. Perhaps it is the quality you exude after having lived the full lives that most women do. Aren’t you curous as to what her story is? That would make a fun theme to write about. Hi Jana. I like the jacket with ink. I love the watermarks and think they are much more interesting than if it was a flat wash. It adds more animation to the drawing – more energy and movement. Keep posting how you like the sketchbook. I’m always looking for new cool sketchbooks, but I don’t like hardbound ones much. Happy birthday friday! Thanks Dee. I’m still really enjoying the sketchbook as far as using it goes, but really frustrated with it for scanning since the pages just won’t lie flat and there’s always a blurred area on the thicker side. How’s work going? Any new studio projects? Do you use Photoshop for your digital painting? If so have you upgraded to CS4 and do you like it better? I just ordered an upgrade–hope it’s worth it.